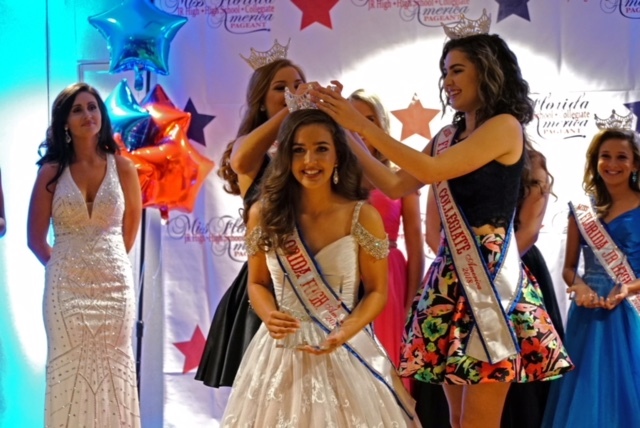 Beaming, sophomore Alison Sweeney took home the crown at the Miss Florida High School pageant earlier this month against 13 other hopefuls. A. Sweeney did not consider competing in pageants, until she received a letter from the National American Miss Pageant competition when she was 10 years old. She liked that the competition did not focus on beauty, but rather centered around scholarship and included an interview portion. “It seemed like a great opportunity. I was really shy at first, but pageants helped me with public speaking,” A. Sweeney said. 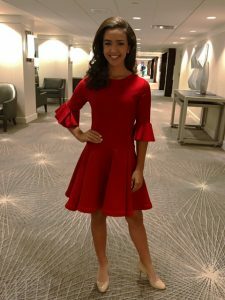 Before her Miss Florida High School title, A. Sweeney won multiple spokesmodel awards for her speeches focusing on topics like the importance of confidence and volunteering. “Seeing her at the podium giving an amazing speech is the most rewarding. She lights up the entire room,” Dan Sweeney, A. Sweeney’s father, said. Prior competition experience gave A. Sweeney a competitive advantage in Miss Florida High School, a scholarship pageant concentrating on academic achievement and community service involvement. However, her commitment to varsity crew and NJROTC separated her from other competitors during the pageant’s interview process. The interview lasts five minutes. From there, a panel of four judges asks contestants questions about their character and extracurricular involvement. A. Sweeney started rowing the summer before her freshman year, with the Boone Crew summer programs. “I used to be a competitive gymnast, so crew’s a good way to stay busy and not be lazy. It’s really fun,” A. Sweeney said. With dreams of flying as a pilot for the Navy, A. Sweeney transferred to Boone for the ROTC program. “It’s my dream come true to go to the Naval Academy and study engineering,” A. Sweeney said. The pageant also includes modeling and evening gown portions. Competitors wear outfits of their choices for the modeling part and must wear a long ball gown for the formal aspect of the competition. “I love to see her on the stage and give a sassy walk,” D. Sweeney said. Miss High School America’s platform, B.R.A.V.E., stands for Building Respect And Values for Everyone. As a state title holder, the organization encourages Sweeney to share the platform to other students. “It’s really cool to talk to young kids about respecting each other’s values. 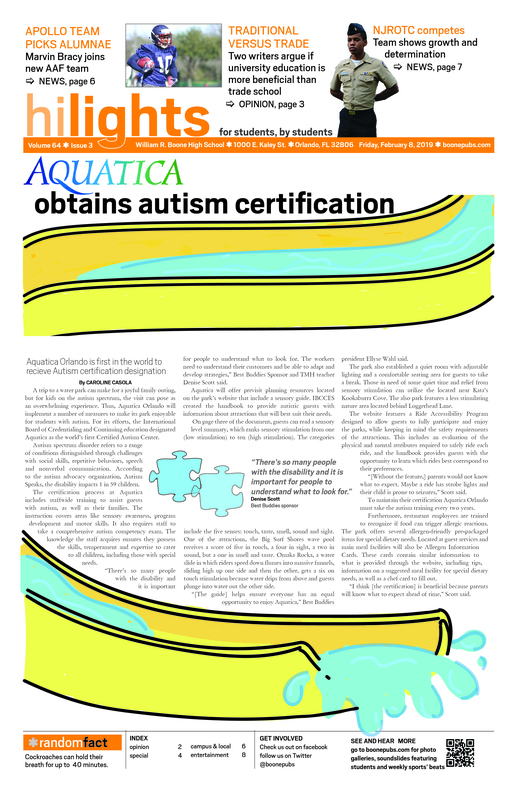 It’s a great opportunity,” A. Sweeney said. As the state title holder, she will represent the State of Florida in the Miss High School America National Pageant, June 24-29, 2019 in Little Rock, Arkansas. To prepare, Sweeney will work with coaches to practice her pageant walk and interview skills. Her parents also help her with speeches. They act as an audience and critique her on representation and body language. If A. Sweeney wins the national title, she will receive a new JL Jeep Wrangler Sport and $70,000 in scholarship, trips, wardrobe, travel, service and additional prizes. Throughout the process, A. Sweeney feels she’s received more than recognition and looks forward to the next competition. “I’ve made so many friends, so I’m excited,” A. Sweeney said.